The 1003DX Speedster® Deluxe Heated Carpet Extractor was designed with cleaning professionals in mind. Each Speedster® has waist-high switches and bucket-high drains. 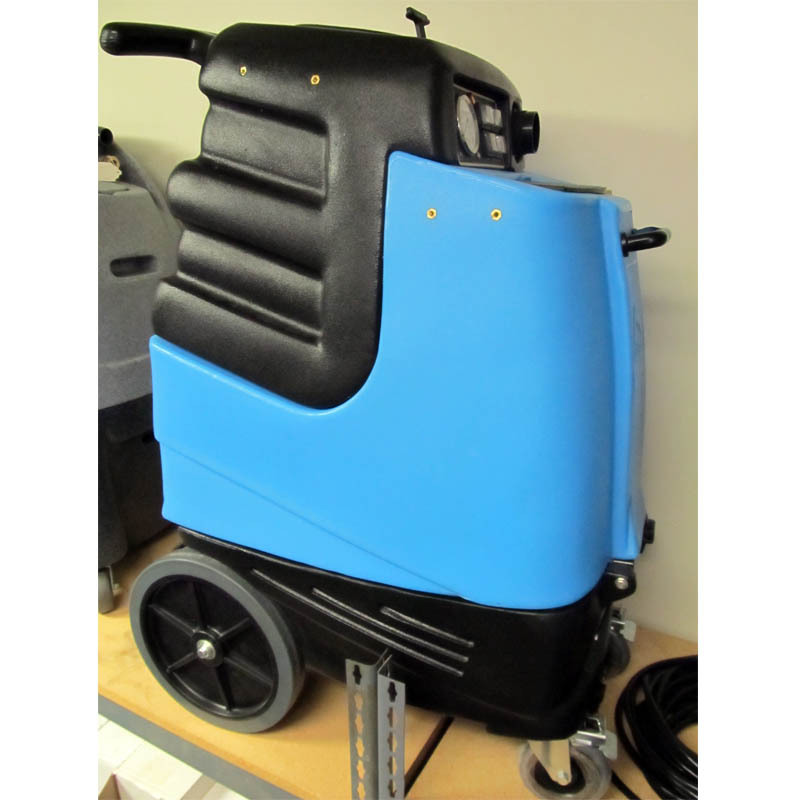 The Speedsters® have 12″ ball bearing wheels and 5″ locking casters for easy mobility around the job site or even stairs. The Speedster® is virtually as good as it gets when it comes to purchasing a carpet cleaner. Durable roto-molded polyethylene the 1003DX Speedster® resists rusting and denting. The Speedster® line of carpet extractors are powerful, portable, user-friendly and affordable. They have features that set them apart from the competition. Made at our California plant, our Speedsters® undergo extensive factory testing to ensure that they meet rigorous quality standards. Mytee® extractors are covered by the strongest warranty in the industry. Mytee® carpet extractors represent the cutting edge in cleaning technology. Take on any job with confidence utilizing the Speedster’s® combination of power and versatility. No one else even comes close. Water resistant switches add protection against dust and water intrusion. Locking casters provide stabilization and prevents any unwanted movement. Lighted power cords indicator plug glows when the cord has power. The easy faucet fill makes for an easy and convenient way to fill up the solution tank. 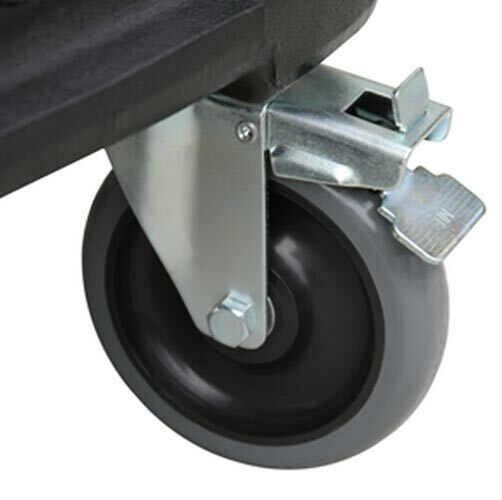 The 12″ non-marking wheels make it easy to go up stairs. Cuff-Lynx™ provide an easy connection for vacuum hoses. Requires dual 20 amp breakers at 120 volts to use heaters or optional 220 volt dryer converter. -Free Dealer provided Air mover of our choice color and brand. Note that both Mytee and SteamBrite reserve the right to change exact specifications without notice. What does this mean? It means that we do not open your boxes and Mytee will change the components that they use to build your machine. We verify the model number and voltage that is stamped on the box. We do not guarantee exact color or shade of your product though usually these ship in the blue family. In early 2018 Mytee is in the process of changing the rear wheels and front casters to a different size and specification. Other changes might also take place. What Mytee does guarantee is that the performance and the product is new and comes with the full manufacturer's warranty with its national service center locations. 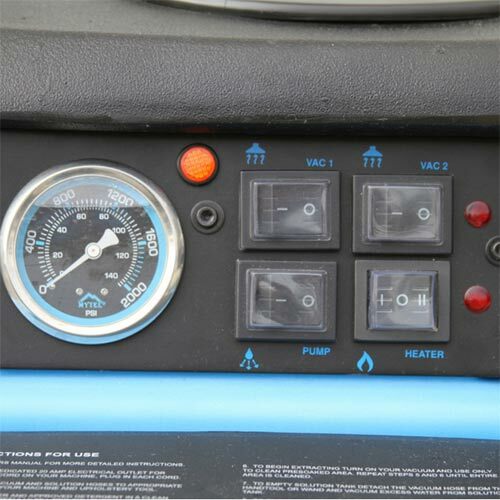 In other words, this is a 500 psi pump with dual 3 stage vacuum in a dual 12 gallon body style with dual 50 ft 12-3 power cords, but the exact pump model or exact vacuum motor, pressure gauge, size of heater, style of caster and wheel, color of the vacuum lid, does exhaust blow at the bottom or back wall, or brand/color of switch that is installed in your machine can be different. In the last year these machine have been built with Pumptec pumps, Cat Pumps, and General pumps. These are all great pressure pumps. The vacuum motors have been consistent for many, many years with the same Electro vacuum motor used but this has not always been the case as some other brands have been used. Constant changes are made on designs to improve performance as well as based on vendor supplied parts. Mytee's warranty states: Mytee may make changes in products it manufactures and markets at any time; these changes are made without obligation to change, retrofit, or upgrade any product previously sold or manufactured. 28" x 18 1/4" x 40"
29 1/2" x 19 1/4" x 46 1/2"
Please note orders filled by the factory will not include this chemical product but rather a quart of Mytee cleaner instead or even no cleaner. Both Mytee and SteamBrite to change offer at any time on free products. 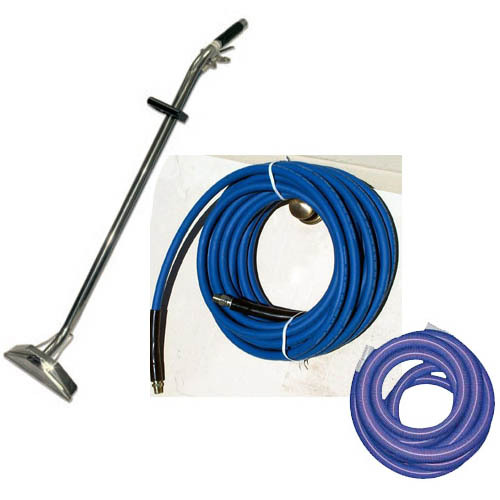 Steambrite will ship the Mytee 1003DX Package Speedster Carpet Cleaning Extractor 12gal 500psi HEATED Dual 3 Stage Vacs Complete Starter Package [1003DX Package] by either Fedex, UPS, USPS, or Freight Quote,, and will normally be shipped within 2-5 business days. Equipment small enough to be sent by ground should typically arrive within 3-5 business days after shipment. Large Equipment could take in excess of 6-8 working days to arrive after shipment, and ground shipping times are not guaranteed. Next day, two day, and three day services are available. Click here for our full shipping policy. Specifications are subject to change without notice. Steam Brite Inc shall have no obligation or liability to buyer whether arising in contract (including warranty) tart (including active, passive or imputed negligence) other otherwise for loss of use, revenue or profit, or any other incidental or consequential damages with respect to any non-conformance or defect in any items provided here under. 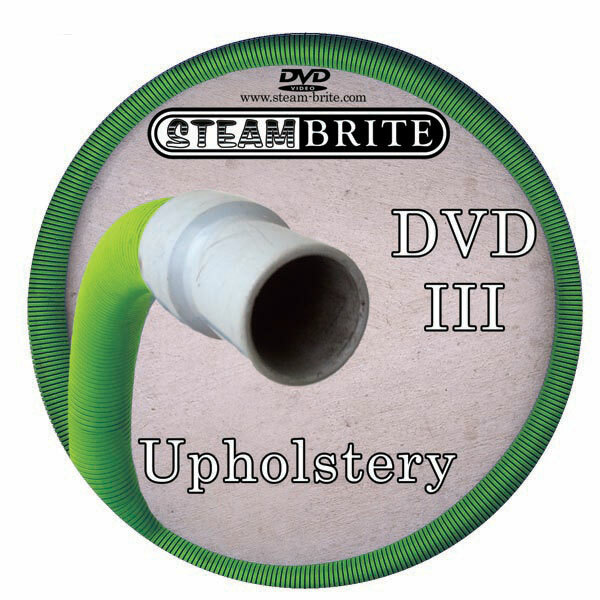 You our customer agrees to indemnify Steam Brite Inc and to hold it harmless from and against any and all claims, cost, liabilities, damages and expenses, including attorney's fees, resulting from personal injury or property damaged caused by the Products. Warranty Disclaimer: Buyer's sole and exclusive remedy for defects in the products shall be as provided in the manufactures's warranty and any other rights provided by law against the manufacturer. Steam Brite, Inc makes no other than as specified in this agreement. All other warranties, express or implied, including but not limited to, the implied warranties of merchantability and fitness for a particular purpose, are hereby disclaimed. 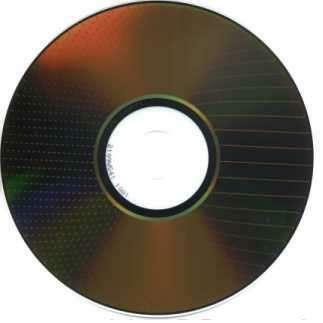 This product was added to our store on Wednesday 15 August, 2012.